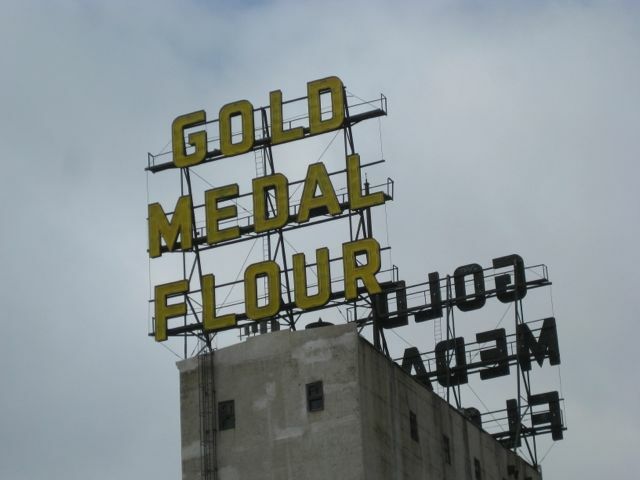 Arguably one of the most iconic riverfront sights in Minneapolis, the twin Gold Medal Flour signs were built in 1910. The signs are approximately 42 feet wide and 45 feet tall, and reach 250 feet above street level at its highest point. Although accounts of the letters’ size vary, according to Skyway News, they are ten feet high and just over six feet wide.The frames are structural steel and the letters are galvanized iron. The sign was originally lit with 1,500 tungsten globes placed in the recessed portions of the letters, but the bulbs were replaced by neon during a 1945 restoration. 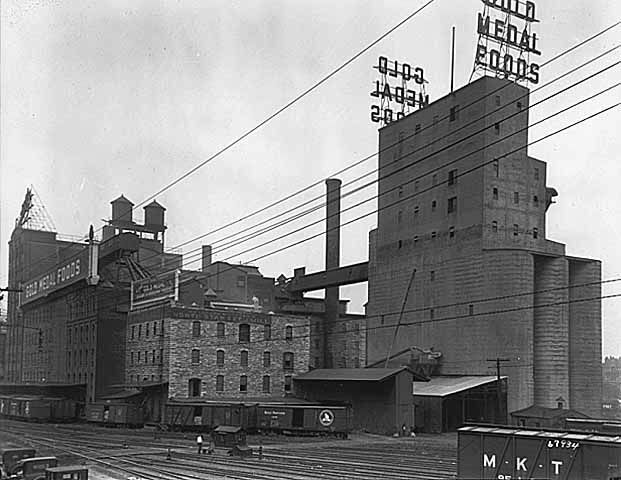 The product which the signs advertise got its name in 1880 when Cadwallader C. Washburn and his partner John Crosby of Washburn Crosby Milling Company (the predecessor to General Mills) won top honors for their flour at an international exhibit in Cincinnati. 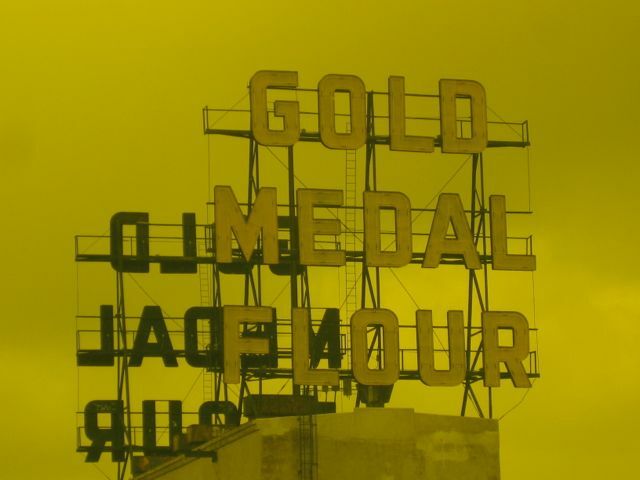 Within its first twenty years, the sign was altered to read “Gold Medal Foods,” but likely changed back to read “Gold Medal Flour” shortly after (the actual date of the change is unknown). 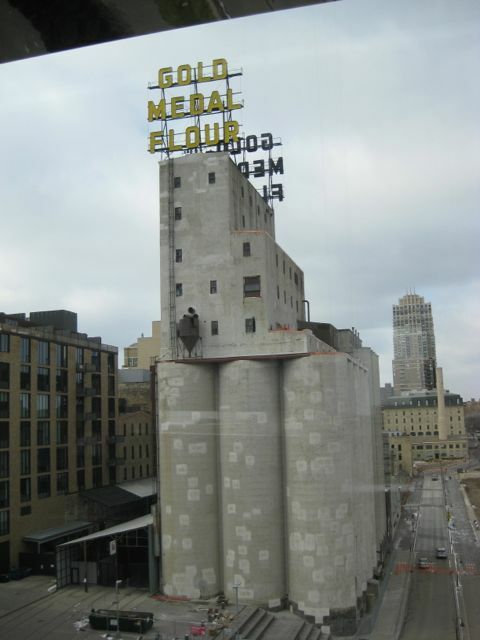 The Washburn Crosby Milling Complex “A” Mill Complex, on which the Gold Medal Flour signs sit, is one of three National Historic Landmarks in Minneapolis, the highest distinction a building can achieve in the United States for heritage preservation. 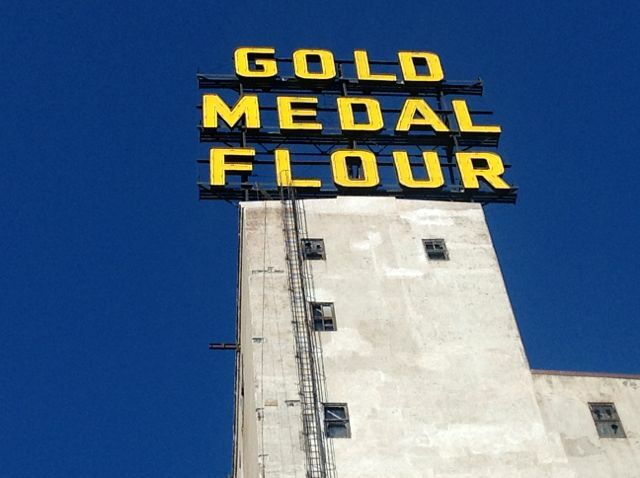 The twin Gold Medal Flour signs sit atop Elevator No. 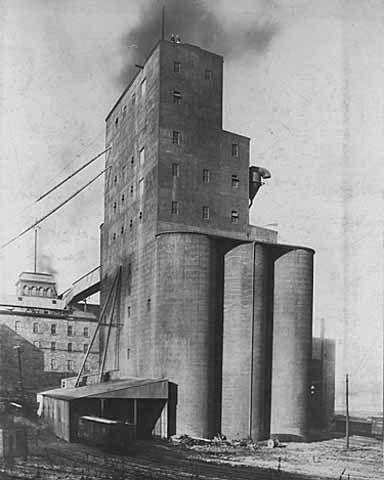 One of the Washburn “A” Mill Complex. 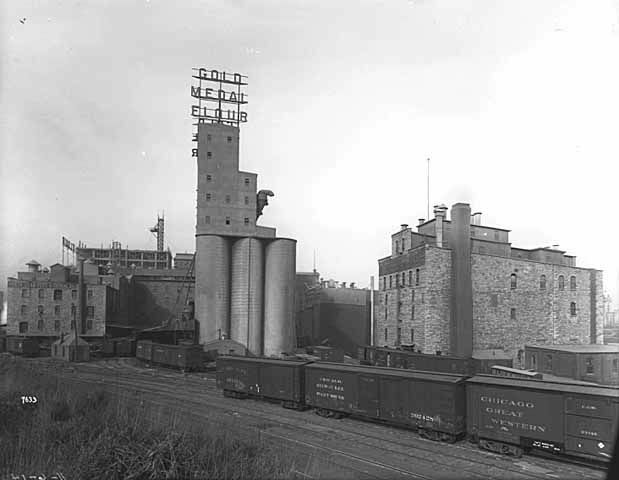 The grain elevator was completed in 1908, and is one of the first concrete elevators to be built in the United States. It consists of fifteen 120 feet high cylindrical reinforced concrete tanks, on top of which is a 95 foot high workhouse. Like a signal fire flashing from a mountain top its story to a distant army or the ray sent out upon a trackless sea from the lighthouse on the shore, speaking to the ships as they pass and repass, there stands today in Minneapolis a sign which nightly tells to the thousands and thousands of people coming and going, not only our own citizens, but those who daily visit the great metropolis of the Northwest from all over the world, of one of the chief brands of the product which has made Minneapolis famous in all parts of the civilized globe. 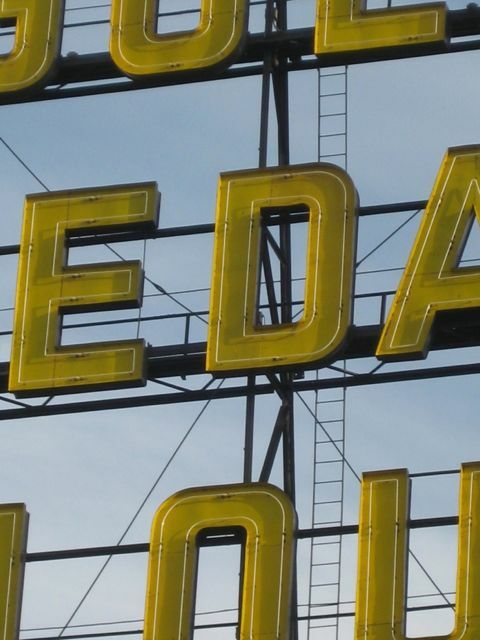 Today, the sign is part of a vibrant riverfront landscape. 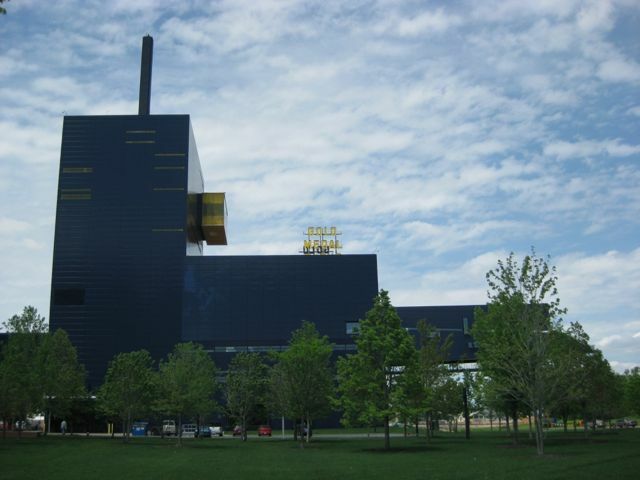 Some of the best vantage points for viewing the sign up close include from within the Guthrie Theater and from the Stone Arch Bridge. 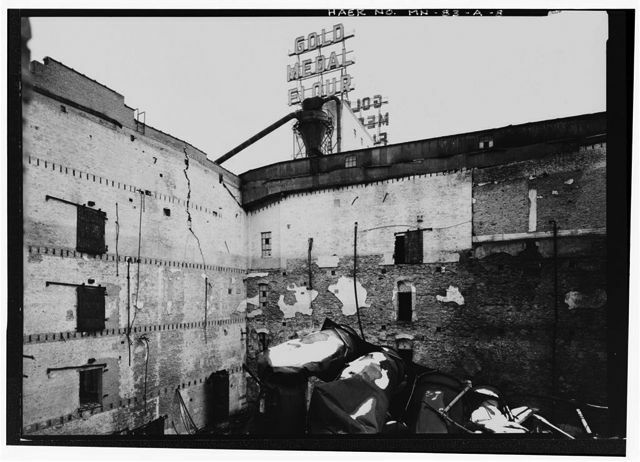 The Washburn “A” Mill was closed in 1965, after which the signs sat unlit for more than 30 years. In 2000, a major rehabilitation project was completed that included cleaning and repairing the sign’s electrical equipment, which allowed it to be relit. 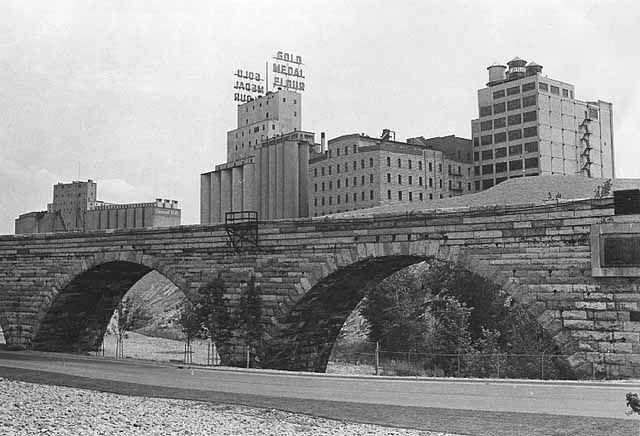 The project cost $240,000, of which General Mills gave $130,000, the Minnesota Historical Society contributed $30,000, and the Minneapolis Community Development Agency, which owned much of the complex, financed the rest. Beckmann, Curtis. “Signs of the Times.” Skyway News, November 6, 2000. “Flour Power.” Star Tribune, November, 16, 2000. “Great Story Told by Mammoth Sign.” Minneapolis Tribune, January 16, 1910. “Landmark Mill Signs Return.” Star and Tribune, November 11, 2000. “Local and Personal.” The Northwestern Miller, February 9, 1910. Petersen, Penny A. 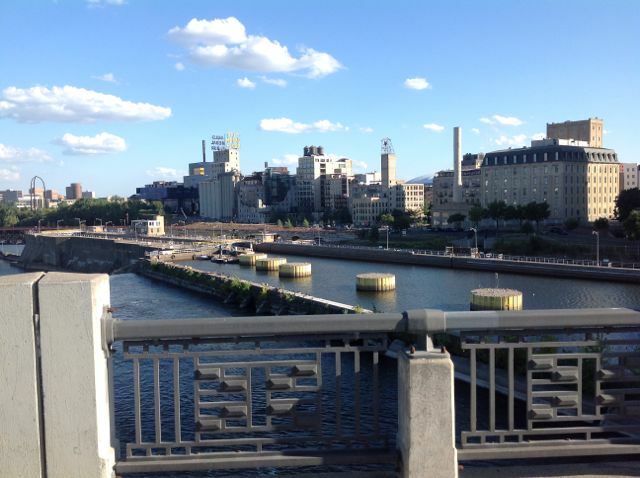 Architecture and Historic Preservation on the Minneapolis Riverfront. Prepared for the Saint Anthony Falls Heritage Board, March 2007. Wilson, Lori. 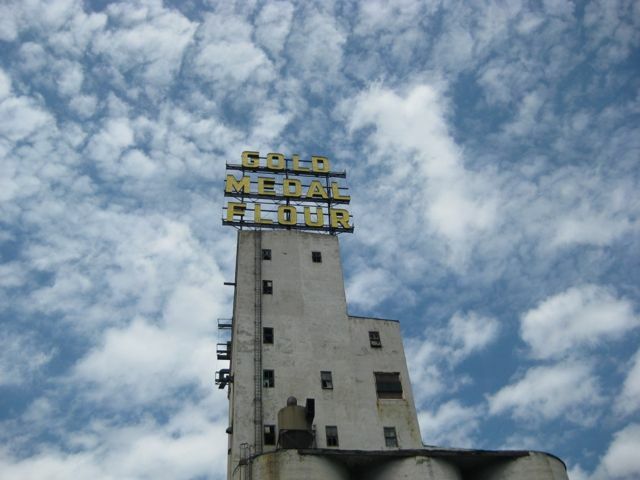 “Vintage Signs of Minneapolis: Gold Medal Flour Mill.” Examiner, June 8, 2009.